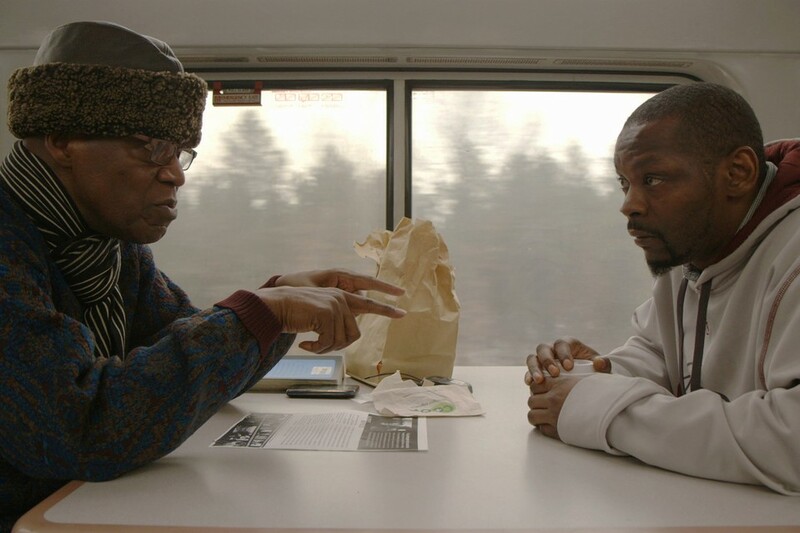 Tribeca 2015: Albert Maysles' "In Transit"
While many of the feature films shown at the Tribeca Film Festival are uneven in quality, historically (at least in the festival's relatively short history), the documentaries are very strong. The diversity of subject matter is inspiring, with inadvertent thematic dovetails. One of the documentaries premiering stands alone, not just for its singular identity and mood and structure, but for the fact that it is the final film of Albert Maysles' career. Great documentary filmmaker Albert Maysles, known for such groundbreaking films as "Grey Gardens" and "Gimme Shelter," died on March 15 of this year. He worked up until the very end: "Iris", his 2014 portrait of style maven Iris Apfel opens in New York on April 29, and "In Transit", the film that followed, is playing at Tribeca. For "In Transit", a film about travel on The Empire Builder, a long-distance train route that goes across the plains of America into the Pacific Northwest, Maysles collaborated with four other filmmakers: Nelson Walker, Lynn True, David Usul and Ben Wu. Train travel has a romance to it, a romance reflected in cinema, obsessed with trains from its earliest days. Trains changed the world. There are faster ways to get where you are going now. But there's nothing like a train. "The train, apart from getting them from the Delta to Detroit, became very important to blues players because of the rhythm of the machine, the rhythm of the tracks, and then when you cross onto another track, the beat moves. It echoes something in the human body. So then when you have machinery involved, like trains, and drones, all of that is still built in as music inside us. The human body will feel rhythms even when there’s not one. Listen to 'Mystery Train' by Elvis Presley. One of the great rock-and-roll tracks of all time, not a drum on it. It’s just a suggestion, because the body will provide the rhythm." Maysles and his collaborators capture "the rhythm of the tracks" in their film. The interviews with passengers are mixed with gorgeous footage of the landscape sweeping by outside, the plains, the oil fields of North Dakota, forests full of snowy firs, towering mountain peaks. People get off, walk into the station and out of the film. Passengers stand on the platform, sneaking a cigarette break, before getting back on the train. The lights go out at night, and the cars are plunged into darkness, broken up by the glow of intermittent electronic devices. People convene in the dining car. They nap. They play cards. They make friends with each other and exchange emails. All of it, every image, every interview, the passengers, the landscape outside, work together to create an insistent compelling pull. On a train, the landscape passes by the window, and passengers can see the land transform outside, from flat-ness to hills, and they themselves are unmoored from the everyday rhythm of their lives. Some of the passengers talk about that feeling. One woman, whose marriage is crumbling, said she took the train ride to clear her head. In her life, she had always been someone's daughter, wife, mother. On the train, she was just herself. She wants to hold onto that feeling once she gets off the train. One young guy has fallen in love and he quit his job and is on his way to go be with her. He never thought he would fall in love, he says. His friends rib him about being "whipped," but the glow of excitement on his face is eloquent. He's full of hope. One elderly woman with bright red dyed hair says she is returning home after visiting the daughter she gave up custody of 47 years before. Her eyes are haunted, but she says meeting her daughter gave her a "new spark." The reunion went well. Her daughter suggested she dye her hair. One of the most memorable moments in the film is a conversation in the dining car between two African-American men (one elderly, who had known Martin Luther King, and one in his 30s). They were strangers before this train ride, and happened to find themselves at the same table. They talk about their lives, about optimism, about morals. The conversation, spontaneous and vulnerable, provides a piercing hope that human beings can, indeed, "only connect," as E.M. Forster (obsessed with trains himself) wished. In their conversation the men find a connection that brings the younger man to tears. He grew up without a father. The older man reaches out to grab the younger man's hand, and holds it, supportively and quietly. Then the film moves on. It does not linger or underline the moments of revelation or openness. Gently, irrevocably, it moves on, as the train moves on. The cumulative effect of all of this is extremely profound. Human beings are treated with gentleness in "In Transit", and so, in that environment, their hopes, dreams, worries, concerns, are allowed room to express themselves with no fear. As the young pregnant woman (three days overdue, causing some consternation among the conductors that she would deliver the baby on the train) hurries across the icy platform in Minneapolis to go meet her mother, her retreating figure seems plucky and indomitable. You hope everything will be all right with her, with everyone you have met in the film. And for me, the movies are like a machine that generates empathy. It lets you understand a little bit more about different hopes, aspirations, dreams and fears. It helps us to identify with the people who are sharing this journey with us. That's what "In Transit" does. It is a machine that generates empathy. Click here to read Josh Golden's encounter with Albert Maysles while he was filming "In Transit." Next Article: Video: Ebertfest 2015 Previous Article: Tribeca 2015: "Gored" and "Among the Believers"